Smoked Northumberland Cheese is a delicate, creamy Cheddar traditionally produced by smoking the cheese over oak-chippings. The cheese is usually left for a minimum of 24 hours, on a smoking shelf, to develop a rich balance of smooth smokiness and a textured cheese. This is a vegetarian friendly cheese made from pasteurised cow’s milk. 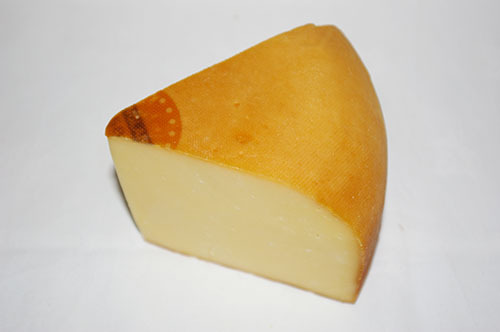 Smoked Northumberland offers an initial creamy, mellow flavour, with a long-lasting beautiful overtone of smokiness. A well balanced smoky flavour, similar to BBQ, becoming richer into a smooth after taste. This texture of this cheese is actually quite rubbery, similar to Applewood in complexion though much lighter and subtler in taste. Smoked Northumberland would work well as a base for cooking with, to add a subtle smokey undertone to any sauces, due to its mild, light flavours. It also works well coupled with a stronger condiment such as sweet chilli sauce or cranberry jelly, on crackers or oatcakes.